Today 56 percent of the Rwandan parliament comprises of women, including one-third of all cabinet positions and the chief of the Supreme Court. 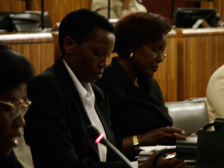 Rwanda also just voted in their first female speaker of parliament, Dr. Rose Mukantabana. While Rwanda has the highest ratio of women to men in any parliament worldwide, the US ranks number 69, sandwiched between Bolivia and El Salvador, with just 16.8 percent of Congress being female. After the genocide in 1994, thousands of men were jailed for war crimes or fled the country, leaving a population that was 70 percent female. As a result women took on roles in politics and business. Forty-one percent of businesses are now owned by women in Rwanda compared with 18 per cent in neighboring Congo. Rwanda adopted a quota system as part of its constitution in 2003, mandating that at least 30 percent of the parliament be women. The country also abolished laws prohibiting women from inheriting and owning property, and encouraged education among girls and women. In spring 2004 — as Rwanda commemorated the 10th anniversary of the genocide — WIDE ANGLE traveled to this fractured nation to make a film that looks forward instead of back. Profiling women on the forefront of change, Ladies First reveals the challenges facing them and their country as Rwanda struggles to build a sustainable peace between the majority Hutus and minority Tutsis — a peace that has eluded the country for almost half a century.